Any undergraduate student from UCA is invited to attend and read from their creative works. This will be an open mic; length of reading time will be determined by the number of students wanting to read. We welcome all genres of creative writing. Toni Jensen is the author of Carry, a memoir-in-essays about gun violence, forthcoming from Ballantine. Her essays and stories have been published in journals such as Orion, Catapult and Ecotone, and have been anthologized widely. Her story collection, From the Hilltop, was published through the Native Storiers Series at the University of Nebraska Press. She teaches in the Programs in Creative Writing and Translation at the University of Arkansas and in the Low Residency MFA at the Institute of American Indian Arts. She is Métis. Voted one of Go Magazine’s 100 Women We Love 2015, Dr. Carla (C.C.) Carter’s raw and piercing poetry has landed her National Slam titles including the 5th Annual Gwendolyn Brooks Open Mic Competition and the Behind Our Mask 1st Annual Slam. Her first collection of poetry, Body Language, was nominated for a 2003 Lambda Literary Award. She released her second full collection of poetry, Body Target to critical acclaim in 2017. Her work has been printed in several anthologies including Word Warriors: 35 Women Leaders in the Spoken Word Revolution. Dr. M Shelly Conner, Dr. Stephanie Vanderslice, and Dr. John Vanderslice will read. 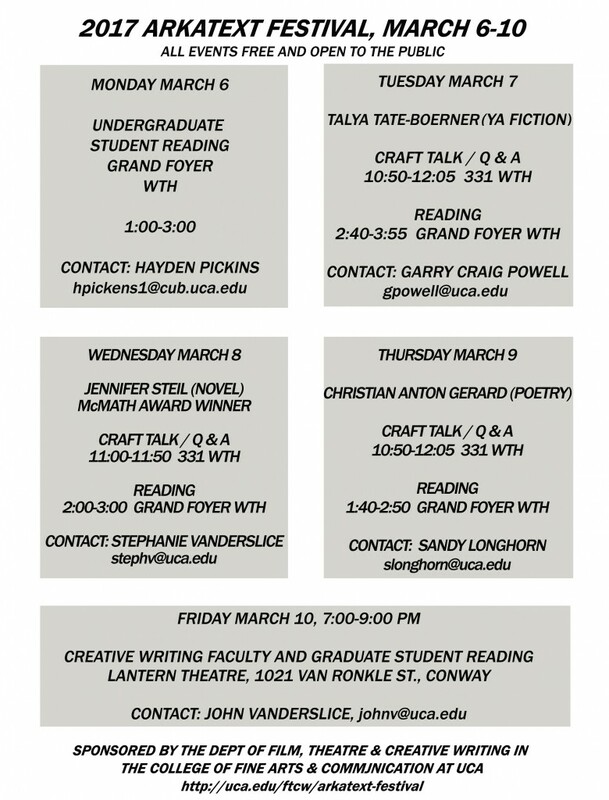 Graduate students from the Arkansas Writer’s MFA Workshop will read from their current projects. A diverse range of voices and genres will be included. Sponsored by the Department of Film, Theatre, and Creative Writing in the College of Fine Arts and Communication at UCA. Rachel Hall is the author of Heirlooms, which has been awarded the 2018 Phillip H. McMath Post Publication Book Award by the creative writing program at UCA. Heirlooms was also selected by Marge Piercy for the G.S. Sharat Chandra Prize. Hall’s short stories and essays have appeared in a number of journals including Black Warrior Review, Gettysburg Review, Guernica, and New Letters, which awarded her the Alexander Cappon Prize for Fiction. She has received other honors and awards from Lilith, Glimmer Train, Bread Loaf and Sewanee Writers’ conferences, Ragdale, the Ox-Bow School of the Arts, and the Constance Saltonstall Foundation for the Arts. Hall is a Professor of English in the creative writing program at the State University of New York at Geneseo where she holds two Chancellor’s Awards for Excellence—one for teaching and one for her creative work. John Andrews’ first book, Colin Is Changing His Name, was a finalist for the 2015 Moon City Poetry Prize and was published by Sibling Rivalry Press in 2017. His work has appeared in Redivider, The Queer South: LGBTQ Writers on the American South, Columbia Poetry Review, Burnt District, and others. He holds an MFA from Texas State University where he served as managing editor for Front Porch Journal. Currently, he is PhD student at Oklahoma State University and an associate editor for the Cimarron Review. Bradley Minnick is an Associate Professor of English at the University of Arkansas at Little Rock and the Executive Producer and host of Arts & Letters–a bi-monthly radio program aired on NPR-member station KUAR 89.1 and affiliate stations. Arts & Letters, sponsored by the Arkansas Humanities Council and the National Endowment for the Humanities, is in its fourth season and highlights intellectual work–primarily in the South. Minnick also writes, hosts and produces Facts About Fiction–a one-minute radio spot that features stories about writers. Arts & Letters podcasts are available on NPR Podcasts, NPR 1, iTunes, Player FM, and artsandlettersradio.org. Dr. Jennie Case will read from her new book of creative nonfiction, Sawbill. Professor Sandy Longhorn will read from recent poems, several of which were written during her Political Poetry class in Fall 2017.